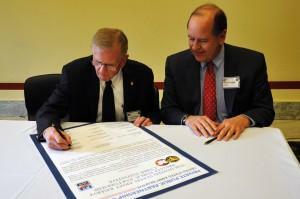 Theodore Drier (left), senior director, intelligence programs and national security solutions, Dyncorp International, and Martin Wood, senior vice chancellor, University Advancement, sign a statement of support with the Army Reserve Feb. 10. Photo by U.S. Army Staff Sgt. Shejal Pulivarti. UCCS is one of six universities and several large private employers that will work with the U.S. Army Reserve to create a new cadre of cyber security experts. On Feb. 10, university, industry, and Army Reserve representatives gathered on Capitol Hill to officially begin the Army Reserve Cyber Private Public Partnership Program Cyber P3. UCCS was represented by Martin Wood, senior vice chancellor, University Advancement, and Ed Anderson, executive director of strategic military, science, space and security initiatives, Office of the Chancellor. Cyber security has become a topic of national concern following high-profile cyber-attacks on computer databases maintained retailers, entertainment companies, insurers and financial institutions. These attacks place personal and financial information for millions of Americans at risk. The Army Reserve is looking to build programs that enhance soldiers’ skills, education and training to prevent cyber attacks on military and civilian computer systems. The program will work in partnership with top-tier regional schools including UCCS, University of Washington, Norwich University, George Mason University, Drexel University and the University of Texas at San Antonio. Corporate partners include Rackspace U.S. Inc., Verizon Communications, Microsoft, Professional Project Services, Chevron and CALIBRE Systems. The FBI is also a partner in the effort. While many details of the program will be decided in weeks and months ahead, Wood said Army Reserve members will likely be eligible for scholarships to allow them to take advanced computer engineering courses at UCCS. As Army Reserve members, they will be able to apply those newly developed to protect military and private industry computer information. This program seems to sidestep those leaving honorable military service who have the willingness and capability of completing the program. I would do the job as a civilian employee of the government – with a reasonable degree of certainty a job would be waiting for me upon graduation. And I would be happy to use my GI Bill to pay for it. I am positive there are many more like me.